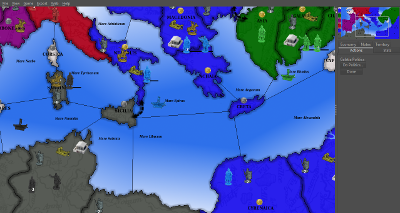 Empire is a free-for-all strategy game set in the late Roman Empire as various caesars take the field to win dominance. Inspired by a once-popular board game. Each caesar starts off in one of six provinces of the empire with a small army and a fortified city. Using his limited supply of generals to lead his troops, each expands and tries to outdo and eliminate the competition - conquer a rival caesar, and you get all his territory and troops as well. Along the way, build and fortify cities, send war galleys across the Mediterranean, ransom or execute captive generals, and cope with rampant inflation as the cost of war doubles and triples.